Since, Internet Explorer 7 (IE7), IE web browser comes with an instant search box on the top left corner of the IE window, where users can search the web and Internet directly from search box which can be populated with multiple search providers. The search provider for the search box is defaulted to Live Search which is now known as Bing (related: how to export search providers). If you never use the search box, or simply don’t like and don’t want another search box to occupy the screen estate when you already installed and used third party toolbar such as Google Toolbar, Yahoo! Toolbar or others, or you simply prefer to search directly from the address bar (URL bar), you can remove and hide the IE search box for good. Thanks to tip by Helcron, the following trick on registry hack will remove the search box from IE forever, making IE a cleaner web browser. Right click on Microsoft, then select New and choose Key. Type in Internet Explorer as the name for the new key. Refer to last figure below for actual look in Registry Editor. 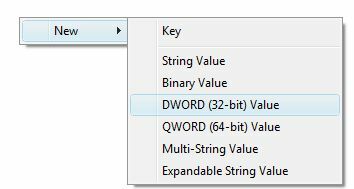 In the right pane, right click on blank/empty space, then select New and click on DWORD (32-bit) Value. Assign NoSearchBox as the value name. Double click on NoSearchBox, and change the DWORD value data to 1. Restart all Internet Explorer windows. Well, if you think the steps in the hack above is too troublesome, here’s an easier way. Simply copy and paste text below to text editor and save as NoSearchBox.reg, and the double click on NoSearchBox.reg to merge the new registry keys to system registry. Close and reopen all IE7 windows, and viola, no more search box. The trick works on all IE7 and IE8 running on Windows XP, Windows Vista and Windows 7.